Silver was making strides this month, which is why people wonder why silver prices are falling this week. Silver prices hit a new low yesterday (Thursday), closing at $16.46 an ounce. This beat out the four-year low silver hit earlier this month when it closed at $16.855. This is a 3% decline on the month, and a disappointing 16% on the year. And it dove even further to below $16 this morning. 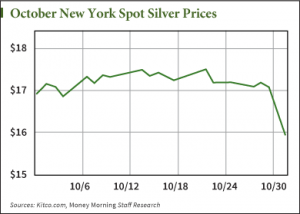 Traders flocked to silver earlier this month, as markets were headed for a correction. The Dow Jones Industrial Average fell almost 7% before rebounding earlier this week. With equities now performing so well, traders are selling off precious metals. And it's not just the red hot stock market that's clobbering silver. The European Central Bank has been eyeing stimulus for a while now. Having cut Eurozone rates to historic lows, ECB president Mario Draghi is running out of measures to reverse a troubling disinflationary trend in the region. His final option: European quantitative easing. A massive bond-buying spree seems to be the only thing that will pour money back into the economy and support a recovery for the struggling Eurozone. While European QE hasn't happened yet, inflation picked up in the Eurozone this month. Also, the mere expectation of QE has investors going short on the euro in hopes of a longer-term devaluation. The Bank of Japan also announced this week it would expand its own QE program. Inflation is particularly good for silver. An eroding dollar will prompt a currency sell-off and make getting into alternative investments an attractive inflation hedge. But the dollar's value has only been going up. The U.S. Dollar Index is up near four-year highs at yesterday's close, and this morning it looks to take out the four-year highs it established earlier this month. More short-term downward pressure on silver comes from the silver futures markets. On Sept. 30, the volume of silver short-selling hit a new all-time high. Speculators held 51,344 contracts short backed by 256.7 million ounces of silver. With silver at four-year lows, you'd expect short sellers to capture gains and cover their positions. And with such a high volume, this short covering would no doubt provide a huge boost to silver prices. In the three weeks to follow the new record-high short position, these speculators have only shed 6.4 million ounces. This isn't nearly enough short covering to help propel prices and build a meaningful rally. So here's how we leave October: hot markets, a strengthening dollar, and historic bear sentiment.